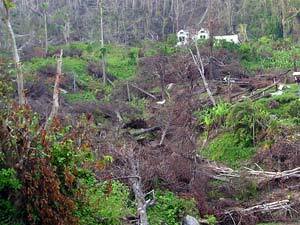 September 7th: Grenada got hit by Hurricane Ivan in the afternoon . It appears that there were tornadoes within the hurricane. We saw trees bending over and their leaves flying off. Then the windows we were looking through broke, flew off, or both. We saw the corrugated iron peeling off our neighbours' roofs: then our own roofs peeled off, or simply lifted off as one piece, rafters and all, dumping lethal chunks of masonry. In the south, most poles bearing electricity and telephone lines snapped and fell, spewing thick high-voltage wires like spaghetti onto roads, before collapsing through roofs and walls. September 8th: The horrible calm of a rearranged country. Hills were littered, with the 'galvanise' roofs of hundreds of ex-houses, their walls and their contents. In many cases, total demolition. Churches and schools fared no better: most entirely decapitated; many lost walls too. The foliage of tens of thousands of trees and the vines that linked them had become a thick textured wallpaper that stuck to everything. Nutmeg trees uprooted, horizontal, brown. The rainforest petrified: truncated, split trunks, grey, devoid of branches or leaves. The Island had lost its clothes. September 9th -24th: We drove around the island and could not believe what we saw. Our country destroyed and our people destitute and jobless. International Relief Aid is coming in, but the government has distribution problems. Friends & Family finally contacted us by cellphone to ask how they could help. We decided that we needed to do something to help Grenada. Our good friends and volunteers from our Grenada Travel Forum (www.grenadatravelforum.com), Anse in the USA & Sandcrab in Canada, stepped into the breach and updated the forum with the latest happenings and news from Grenada. Our hands were tied since our homes & offices were damaged - Ivan took our roof, our electricity, our phone lines, and most of the contents of the house. We got together with our good friends in Grenada, Mandoo (Mandoo Tours) & Ian (Sunsation Tours) and our Cousin Paul (Rich & Rich) in Miami - and our small relief organisation started. We asked the government for advice, with no sucess. We contacted C&W for relief phone lines - no success. After two wasted days we decided we would go it alone. Paul in Miami opened a donation account. Jim & Anse posted our appeal and a couple of days later - donations were arriving in Miami. September 25-3rd October: Land phone lines, computer & internet at last! Sunsation Tours' office in Grand Anse is connected, and they are allowing us to use it for our relief aid. We start sending letters to companies & friends worldwide, and get some great responses. Friends in the UK, USA and Germany begin fund-raising for Grenada. We get together with Kai & Anja (Grand Meadow) who start relief aid in Germany. We set up our website, to inform people of Grenada's plight and of our response. First food shipment arrives from America. 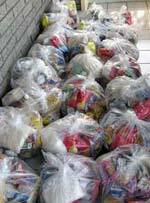 We check that everything is there (it is), take it away, and package it into over thirty substantial bags for distribution. We take several relief bags to Hope Vale. People tell us that they have not seen any government food trucks, (in four weeks!) because the trucks only travel along main roads. Their gratitude is a humbling experience. We hear that local truckers are charging the Red Cross $EC500 per day for deliveries: as much as some people earn in a month. Oct. 6th:. food distribution to families in Apres Toute. This is normally one of the 'market garden' areas of the island, with fruit and vegetables growing everywhere among many acres of nutmegs; now, there is not a tree with leaves in sight. We found houses with seven, ten, even eighteen occupants, because so many houses had been destroyed that peope had had to move in together under remaining bits of roof. Most had lost all income: the last food distribution they had seen in this out-of-the-way settlement had been three weeks ago, We met some delightful people, whose open friendliness went beyond 'mere' gratitude. Grenada is greening over again, giving us a psychological boost. Grenadian and foreign teams are re-planting electricity poles, and power and light are edging out of town along the main roads, the streets gradually gaining lighting. The few houses whose roofs were spared are being reconnected. Thank you Trinidad, thank you St. Lucia. And thanks to those HEROES who are collecting garbage and trucking it away: what a massive task. We had an approach from a teacher at a German UNESCO school: they had organised a collection to help rebuild a school roof here, and were ready to mobilise a whole network of other UNESCO schools in Germany to increase the donation. They needed someone here to liaise with, and a school to sponsor. Having received no response from a variety of agencies, (German foreign office,embassy in Trinidad, honorary consul here), she was given our number. We went today to the Education Ministry, spoke to the Permanent Secretary and the Minister, and contact was at last established. A frustrating morning, because we had no internet connection with the outside world. 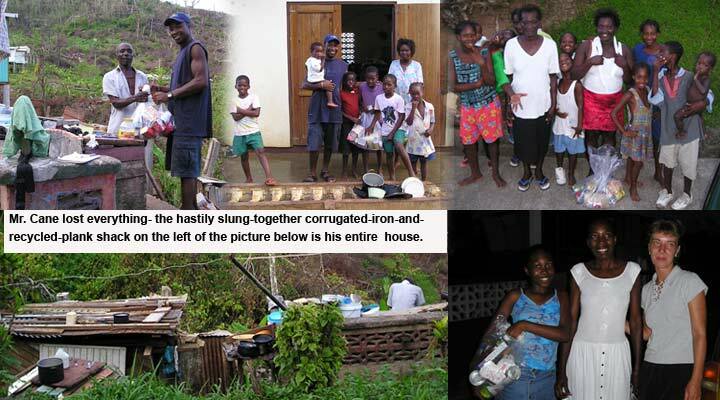 In the afternoon, we distributed all the food we could to the Bel Isle and Apres Toute areas of St. David's. Everyone told us that the Red Cross had brought food several weeks ago, but had driven through the little backwaters we visited, without stopping. One woman had taken in 27 'refugees' after the hurricane had destroyed their houses, though most had left now. This area was the breadbasket of Grenada. Now you can walk for an hour without seeing any fruit. The government expressed the wish that Grenada could soon stop being 'aid-dependent'. I'm sure we all agree: but without homes and work, many people will need aid for a long time to come. Some people were in a pitiful situation: But their dignity shone through. All agreed to being photographed, if it would help keep the food coming. It was a pleasure to meet them: if only the circumstances had been different. We are currently waiting for the next shipment to arrive via Tropical Shipping, which should be today, Friday. This is the next set of aid which was sent to Paul in Miami, with additional foodstuffs purchased with donations sent to us there. We have given out all the relief sent so far: over 32 families received food packages from us. We have been corresponding with a few other private aid organisations who needed information about the affected areas, and who would like to work with us. Our efforts are ongoing in Canada, England, Germany and the United States, but have seen a marked drop off in donations. This is mainly due to the fact that we are not in the news at the moment. However, the need for donations has not abated. Nutmegs, tourists and roofs, have magically reappeared. Ex-president Carter is here. Colin Powell has been and gone, promising much aid. All but 18 of the escaped prisoners have been recaptured. Some were apprehended in St. Vincent! Customs duty has been re-introduced on chain saws and generators for all those without a permit. This is to deter people from importing them duty-free and selling them. Both Gouyave and Grenville have had electricity restored. Teams of Trinidadians have been cleaning the streets of St. George's: removing the debris of fallen trees and power lines, even hand-sweeping the roads. We salute them: they are making a real difference. We have driven around the Island to check on progress. It is heartening to see that many of the tourist venues are on the point of re-opening. Much of the Island looks good: the north was comparatively unaffected by Ivan; trees are still standing and have leaves and even fruit. The south is becoming green again, and many roofs have been replaced by tarpaulins. The rainforest is taking longer: most of the visible green comes from grass and creepers: trees are reluctant to sprout. Mountains look bare and 'European' for lack of trees, and can be seen from afar - a new experience. Most schools (except Grand Roy) have re-opened, though only the older classes are attending in most cases. Convent has problems with asbestos in the damaged roof. Very many schools lost their entire roofs, and are having to make do under tarpaulins. We visited the Boca Medical Station to give out medical goods donated. Apparently medical stations are not kept supplied as extensively as the main hospital. The goods were very warmly received. As our effort is organised on the internet, we have been berating Cable&Wireless to give us some idea of when we can expect to have our service re-connected...no joy there. Currently we are relying on the generosity of Sunsation Tours for use of their office facilities. Grenadaexplorer received another food delivery via Paul (USA) on Tuesday. After sorting it into bags, we took it to two remote areas off the east coast road: Tuilleries and Bamboo‚ (past Munich.) We gave out over twenty bags, and wished we had had ten times as many. All told the same story: one or two food trucks had been in the area (in six weeks), but they stuck to the main roads: by the time word had got round that there was a food truck up the road‚, it had long gone. Some people had received one delivery in six weeks: others had noting. One had had a special delivery‚ from his local representative because of the remote location: but that had long been used up. Three recipients were elderly, and would not have been agile enough to run to a not-so-nearby truck. We took a newspaper reporter with us, so that he could ask his own questions and come to his own conclusions about the value of our work.